Hot dogs, parades and apple pie, there's nothing like the USA! Now, show your love and pride for America every time you carry the American Pride Tote Bag, an exclusive custom fashion accessory. This American flag-inspired bag features the iconic colors and design of Old Glory, bringing stars, stripes and style to your look! Crafted in a soft poly twill and quilted in a traditional diamond pattern, this women's quilted bag features striking flag art with a washed blue denim effect on the top, trim and handles and a brush stroke effect on the red and white stripes. A top zippered closure and a blue fabric lining with an interior zippered pocket and two slip pockets add practicality. Plus, a red, white and blue enameled USA charm dangles from the strap to complete this patriotic look. Are you proud to be an American? 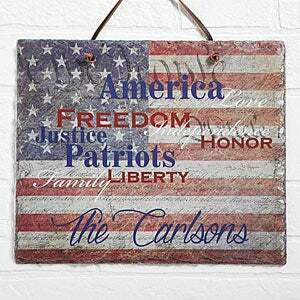 Now, you can take your noble message of American loyalty with you everywhere when you carry the U.S.A. Pride Personalized Tote Bag, showcasing an original patriotic design. This do-everything, go-everywhere personalized canvas bag organizes all of your essentials in compact, sharp-looking style that's truly American. Plus, the front flap pocket is personalized with your name for a one-of-a-kind tribute to the U.S.A.
Simone Biles gymnastics grip bag in navy nylon/spandex features a patriotic sublimated design and Simone Biles' signature printed in inktek with a red mystique drawstring. This Stars and Stripes high heel storage chair ottoman is a proud decorative way to display your patriotism everyday! ~ The back rest of chair (height is 21") is made for comfortable resting while performing leisure activities. ~ The conveniently hidden storage space (13.5"x13"x14", L x W x D) allows for storing books, magazines and more. ~ The chair's framework is made of solid wood accompanied with faux suede on the outside for sturdiness and comfort. ~ No assembly is required. 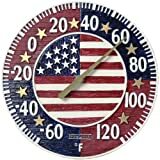 This 17.5" tall functioning thermometer will stir your pride for America every time when checking the temperature outdoors or indoors. It has holes for mounting at the top and bottom.